For a researcher, the music industry's earliest version of the 99 cent MP3 single download is a wonderful source of images of the well-known and long-forgotten artists of the vaudeville stage. 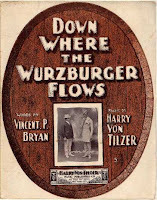 The tune featured is "Down Where the Wurzburger Flows", with music by Harry Von Tilzer and lyrics by Vincent P. Bryan (who would later work as a writer in Hollywood. According to Wikipedia he assisted Hal Roach in directing early Harold Lloyd films. IMDB has him as a writer on Chaplin films). According to an article in "The New Yorker" from May, 13, 1950, VonTilzer had a place like New York's Luchow's Restaurant in mind when he penned the song back in 1902. A Big Apple landmark at East 14th Street, the German restaurant featured "Handsome carved-oak paneling, hugh mirrors, etched glass, skylights and wall murals" was a favorite of Diamond Jim Brady's. The Keatons were certainly not solely responsible for the popularity of "Down Where The Wurzberger Flows". As was quite common with sheet music, various editions featuring the same artwork (right down to the number 5 the in the lower right edge of the barrel) can be found. The single difference is the photograph featured. Artists like the Nora Bayes, Dudie Koller, Edwards and Ronney, "German Dialect Comedian" Pete Baker, the appropriately named Billy Single Clifford (who in 1905 had the Clifford Theater built in Urbana, Ohio) and others. Visit the Levy Sheet Music Collection at Johns Hopkins University for a digital image of the words and music. Perhaps we should add this tune to the songs played at the annual Speakeasy that follows the Keaton Films at the Frauenthal in Muskegon each October. The Keaton's were also featured on another release from the Harry Von Tilzer Music Publishing Co. Sterling provided the words for "On A Sunday Afternoon" - "sung with great success by Joe, Myra, and Buster Keaton - Comedians".